Firefighters and police at the scene. It was midnight. Morro Bay, CA — News about it went national… and the manager paid a big price. The punking happened Saturday evening, February 15. I’m publishing it now because I’m finally getting to the bottom of it. As instructed, Pete and his helpers went all out smashing the windows. Later, criticism aplenty! “Punked” was the verb used by the Bay News, a local paper. I had never heard the word. Means in a crazy, monstrous, spectacular way. It made U-Tube but got pulled off. No idea why. It happened a few minutes before 11 P.M. That’s the closing time for inside service. An occasional car was pulling up in the drive-thru. That closes at midnight. The night manager was Peter Simonci, in his late 20’s. That’s a fictitious name. He is embarrassed, and I understand why. He got a terrible shellacking in public opinion, and it wasn’t 100% fair, in my view. Pete smashed the doors with his car. Felt it was the quickest way. It also did a job on his car. It was Pete’s first management job. In high school he had worked at another fast food a few weeks. In the intervening years he had worked at this and that. Burger King was giving him about 27 hours of work a week. He says he knew of nobody there working a 40-hour week. Maybe one exception, the daytime manager. He received no holidays off, no medical insurance, no perks, he said. He is married and has a little child. His wife works part-time in a local store. He needed more work. Found some doing drywall and rough carpentry for a local contractor. So, two jobs. At about 10:40 p.m. he got a call on Burger King’s landline. It was the Morro Bay Fire Department. An official there – a man, he says, very mature, very official sounding–told him it had been detected that the natural gas at the Burger King had reached a dangerous level. He did not explain how the Fire Department got to know that. The official told him to turn off the Asun (that was the brand name the man used) gas suppressor in the kitchen. He would hang on. Pete hopped to it. Didn’t know where the gas suppressor was. He was still in the training stage, he said, but had never been told of that equipment. It took him a minute or two to find it. Or what he thought it was. He turned it off. Returned to the phone. The official–he never gave his name–was still on. Told him there was still a danger of an explosion. Told him to open the windows – break them if necessary – to let fresh air in. Pete said the official was on the phone 15 minutes or more. First, Pete opened the restaurant’s two main doors–but they close automatically after somebody walks through. That wouldn’t do. The restaurant (which seats about 40) has 18 windows. Big ones. All permanently sealed. Working with him that night were two associates, both young men. There were still two customers inside. Pete ordered everybody out. How to let in fresh air? Pete got a tire iron from his car. Didn’t say how the others went about it. All three went around outside smashing windows. Determined to do his utmost, Pete got into his car and drove it into the main door. Not a big bang. He did it slowly, firmly, he said, just enough to do the job. Then he drove to the other door. Same thing. Yes, he went all out. By then, a fire truck and a police car had arrived, sirens off — it was so late, so quiet out– but red lights flashing. Leaving the truck running and the lights flashing. The firefighters rushed in, equipment in hand. They smelled no gas, found the gas connections intact, saw no mechanical problem. By then, the Fire Department’s caller was no longer on the phone. It was 3 A.M. by the time Pete got back to his wife and child. He explained the whole thing. Wow! Finally they got to bed. He couldn’t sleep. But he felt good. He had done his best in the huge emergency. His biggest ever. 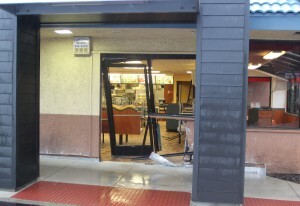 But the shocking fact was that the Burger King had been punked. The emergency was totally phony. It was all a lie. 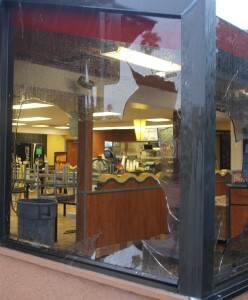 The Bay News, that local paper, reported that police estimated damage at $35,000. And that police checked the Burger King phone and were trying to determine the details of that call and the mystery man who made it. So who was that Fire Department “official”? A disgruntled Burger King employee somewhere wanting to get even? Unlikely because of his mature, calm, well-spoken, informed instructions. Some nut just out to have excitement by causing havoc? Who else? So far, it seems anybody’s guess. It may have been someone not in Morro Bay. Maybe someone in Texas or West Virginia or Timbuktu. Who knows? I’ve tried to get all the facts right. Started out by going to the Morro Bay Police Station—my first time—and met Chief Amy Chistey. I’m of a certain age—surprising to see a police chief who’s a woman, dressed in a police uniform with a silver badge on her chest and a gun on her hip. She was welcoming. Cordial. But no details to give me. Told me Cpl. Mark Martin was running the investigation. The next day Pete was suspended. And two days later the two owners (he had never met them) came in and told him that he was being terminated – effective immediately. Their reason: his presence on the job would be a continued embarrassment and diversion. In other words, a big PR headache. They had him sign a paper. Pete told me he was given no copy. I host a talk show every Saturday on 97.3 FM, The Rock. I always meet my weekly guest ahead of time. To get to know one another, discuss our topic of the day, mention a “difficult” question I might ask. That’s only fair. Gives them a chance to consider how they might answer it. I’ve sat there at Burger King with a couple of my upcoming guests. It was a cozy, quiet environment. Neutral. They enjoyed it, too. Worked out fine. The counter clerks who worked evenings knew me as “John…you know, the old man.” Sometimes they’d get me my coffee (my only cup of the day) as soon as they spotted me walking in, even before I made it to the counter. I knew Pete only as Pete. Saw him as an eager, smart, hard-working young man. Never idle for a minute. If business was quiet he would start re-stocking the creamers and napkins. Checking the soda machine. Sweeping the floors. Mopping the bathrooms. More than once he approached coffee pot in hand to offer me a free refill, which I always declined. I admired him. Felt he had a future. Got into a couple of brief but meaningful talks – my intention was to encourage him a bit … make him think wider. Well, of course, I heard numerous comments about this punking from locals. I saw emails about it. Everyone thught Pete screwed up. They blamed him. Their reaction seemed unanimous. Burger King was right in canning him, they ware saying. I’ve also talked to Burger King associates of Pete’s. Close-mouthed. They say he “freaked out” that night. I decided that I would contact Pete. I found out he was Pete Simonci (to repeat, not his real name). Got his phone number. Wasn’t easy. Called him. He agreed to meet me. I found him in remarkably good shape. Calm. Composed. I was afraid he might be at home, in bed, hugging his pillow, his blankets pulled up over his head, in black despair. That could have happened. Not so. Did not appear angry. I’d be very angry. He was hesitant to give me details. Very. Said he had been instructed not to talk. I told him he had some rights. The right to complain. The right to tell his side of the story. Our Constituion assures us of freedom of speech, doesn’t it? He was being accused of bad things. Only fair that he should have his say. And he trusted me. He told me he was back in construction but needed a lot more hours. He said he gets many hugs. “Many people are for me. My family all are,” he said. Told me the front end of his car suffered major damage. I was sure it had. No insurance money to be collected. That the car wan’t worth repairing. No money for another. Of course he needs one. Told me he’s planning next semester to enroll at Cuesta Community College nearby. He wants to study to be an electrician maybe. At the Burger King I had managed to get the first name of the franchise owner, Mike, and a phone number. My contact, who was nervous about this, did not know Mike’s last name, just H something. I went to Morro Bay City Hall. Two departments. I met great reluctance. Finally I was given the owner’s name, Michael A. Hunerian. No address. I thought all that was public information. It certainly was years ago when I was a reporter. At least in Massachusetts. I called Mr. Hunerian. I was pessimistic. He was under zero obligation to say a word. “Who are you?” were his first words. I told him how I was a regular customer, was appalled by the punking, knew Pete the ex-night manager as a fine worker, was a writer, and wanted to get his side of the story as the franchise owner confronting this extraordinary situation. He answered my questions and pleasantly. Said he and his wife own three Burger King franchises. Said that yes, Pete had been terminated. Agreed with me he was a good worker. Pete had signed a paper, and was given a copy in an envelope. I asked about the investigation going on. He told me that the same thing had occurred in several other states. Told me that the fake official from the Fire Department was a youth—age 15 or so—in Canada. That the FBI had been asked to investigate but had declined because the alleged perpetrator was up there. I mentioned that sounded preposterous. Crazy. After all, Pete had said the caller had been a mature man, authoritative. Mr. Hunerian told me that telephone voices can be changed digitally. The motivation? He had no idea. Who knows? The Burger King has been undergoing a top-to-bottom renovation. It began before the punking. The Bay had reported that police had estimated damages at $30,000. Mr. Hunerian told me that that figure had turned out to be accurate. I asked because I thought some of those expenses might have been incurred anyway. The store is open and is doing fine, he said. As you may know, Burger King has gotten national attention by introducing hot dogs to its menu. The Home of the Whopper is selling hot dogs, two kinds! He told me that the hot dog intro was going well in his three restaurants, and best in this one. After the call, I had a good opinion of Mr. Hunerian although I didn’t like his canning Pete though it was his right. But now my quandary. Pete is not returning my phone calls. Completely mum. I don’t have his address. I probably could find it. But I wouldn’t want to show up after this total break-down in communication. Maybe he’d react in a bad way. Before talking to Mr. Hunerian I had told Pete that from what he had told me, he might have a good legal case. I even got him the names of two lawyers who would listen free to his side of the story, and their phone numbers. But I haven’t been able to give him that info. It’s a fascinating story. Who pulled off that punking? I’ve put a lot of work into it. Pete never mentioned that he didn’t want the story told. Some insiders know Pete’s identity, of course, but I’ve shielded it. And I’ve given up on hearing from him. So here’s my report. I hope he’s doing all right and will make a future for himself. I believe that in another emergency, he might turn out to be a hero. His reaction that night tells me that. I’ll let you know if the police investigation turns up anything and goes public with it. If you had been the young night manager still in training that night, how do you think you would have reacted?